Early one Friday morning (17th of October), Mrs Vicarage, myself and the Vicar of Lindley climbed aboard the Mystery Machine and set off on an intrepid journey to York minster. This ancient place of worship is a venue we are becoming more accustomed to since the formation of the new diocese of West Yorkshire and the Dales so clutching a fist full of different coloured tickets and a variety of colourful robes we set off on an adventure. This was the first time any of us had been to a consecration before so we were interested to see what would happen during the service. There were hundreds of people gathered to celebrate with Jonathan and Toby. In traditional Church of England style there were lots of legal aspects of the service that needed to be done in the service such as reading the letter of authorization from the Queen. 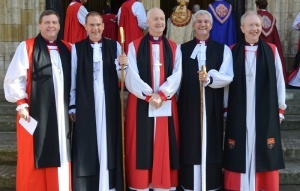 I have never seen so many bishops in one place at the same time! 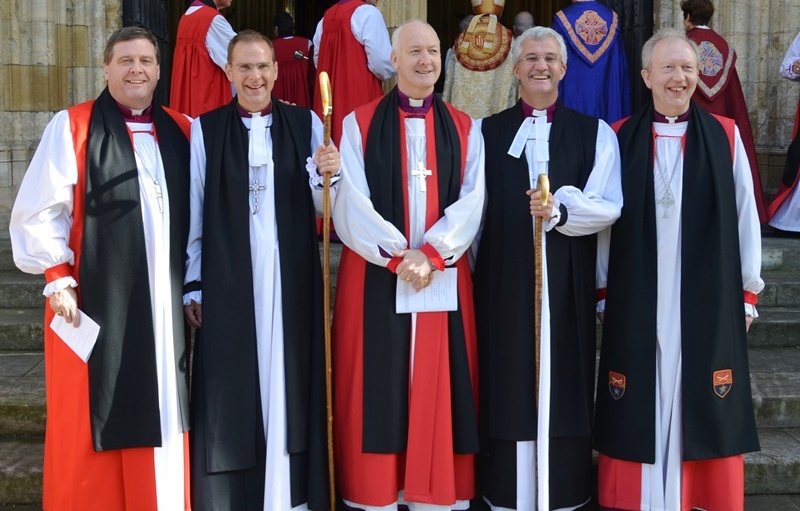 When Jonathan and Toby were consecrated all of the Bishops gathered together in what looks like a scrum to place their hands on them. One of the highlights of the service was the preacher, Justin Welby, the Archbishop of Canterbury. Then we all headed into York to find a pub lunch. A fantastic way to finish a great day!